The dazzling patterns and colors of old-fashioned Formica grabs attention. And in a world run amok with granite countertops, this has never been truer. Formica (laminate) used in the Frank Lloyd Wright-designed Gorden house at the Oregon Gardens in Silverton, OR. Formica is made of paper, topped with a high-grade paper, with bright solid colors or wild patterns soaked in resin. To achieve its strength and thickness, a filler of brown paper is soaked in phenolic resin. The excess resin is then squeezed out using rollers, sort of like an old-fashioned wringer. From there it goes though a drying oven and is cut into sheets. The decorative paper side is coated with a clear melamine overlay sheet to give it resistance to moisture plus wear and tear. Then the stack is compressed into the decorative sheet we are all familiar with. 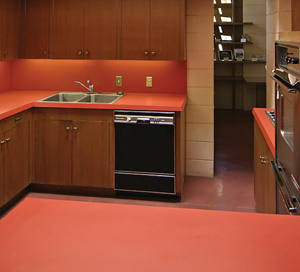 (When installed as countertops, Formica usually has a metal edge molding, giving that classic mid-century modern look). Sometime in the sixties, companies used this sheet product and glued it to chipboard and molded it into a solid countertop. These countertops had a smoothed intergraded 4” backsplash to stop water from leaking where the backsplash met the counter and a bull-nosed end with a raised area to stop water from spilling over the edge. Laminate looking like butcher block was (and still is) a popular style. To this day you can buy these countertops at big-box stores in 8’- and 12’-long sizes. Or have them custom-made with more color and pattern choices. Looking back in time, Formica was originally created in 1913 as a product for electrical insulation. It was an alternative “for mica,” a mineral that was often used due to its low heat conductivity. Mica was also used for windows, in cast-iron parlor stoves, lampshades, and other uses where heat was an issue. Formica initially acquired resin from the Bakelite Corporation. But politics between Formica, Bakelite, Westinghouse, General Electric, and Redman (a Canadian chemist) brought legal conflicts. Apparently, all of these corporations could see that something big was being created, and they all wanted to be included. In the end there was a consolidation of resin manufacturers, which became the new and improved Bakelite Corporation, which then sold resin to all other manufacturers. The first sheet of Formica came off the production line in 1914, although it was still a product in its infancy. In 1927 the Formica Corporation patented a barrier sheet. It was the first step toward the development of a future countertop material. Ten years later, in 1937, the Formica Corporation had created numerous laminate products including countertops, tabletops, wall laminates (which were used in the Queen Mary ocean liner). It was during this time that the clear protective melamine coating was added to protect the decorative lithographed paper, thus opening the doors to many new applications. Following World War II, laminates were marketed aggressively for their design features, durability, versatility, and easy maintenance. By the early 1950s it was estimated that nearly one third of all new homes built contained plastic laminate. Formica products were starting to show up in bold, bright colors and stunning patterns, such as the iconic Cracked Ice or more subdued Linen patterns. The Boomerang pattern was also very popular during this period. The 1960s and early 1970s brought other colors and patterns as tastes and styles changed. By the 1970s, DuPont’s Corian countertops, which are made of natural minerals and acrylic resin, began to become the countertop of choice, beginning the downward side of the Formica fashion cycle. Corian offered a continuous surface without seams, did not need the metal edging, and could incorporate sinks seamlessly molded into the countertop material. Still, for homes ranging from 1930s Art Deco style through the 1970s, Formica is a great countertop option and gives durability along with a vintage look. The colors and patterns of vintage Formica remain absolutely remarkable — colors covered the spectrum of the rainbow, and each decade had its iconic patterns. For those who wish to recapture the vintage look of their home, it is still possible to get Formica in some of the colors and patterns many of us grew up with. 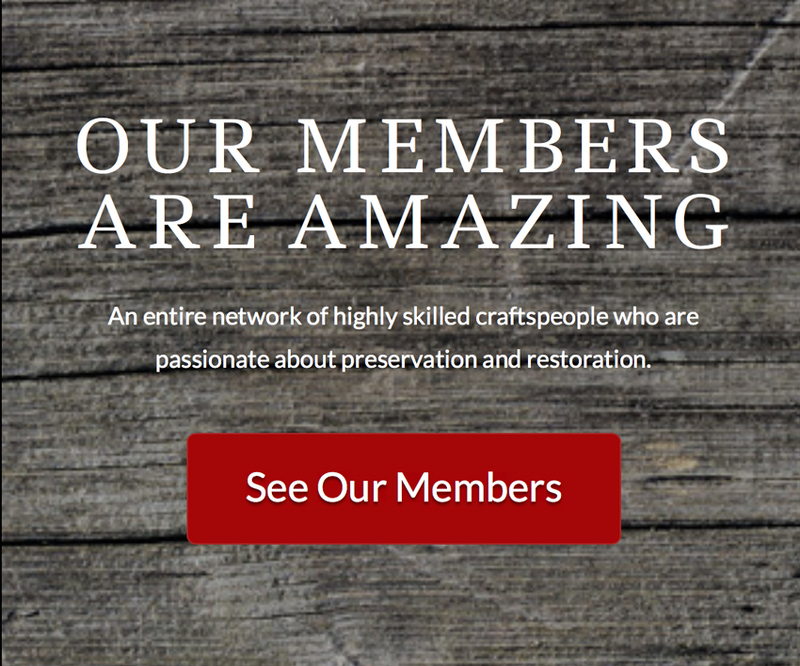 Below are a few websites that can also provide some ideas about the colors and patterns. Even if you are not in the market to purchase Formica, these sites are fun to look through and can transport you back in time.